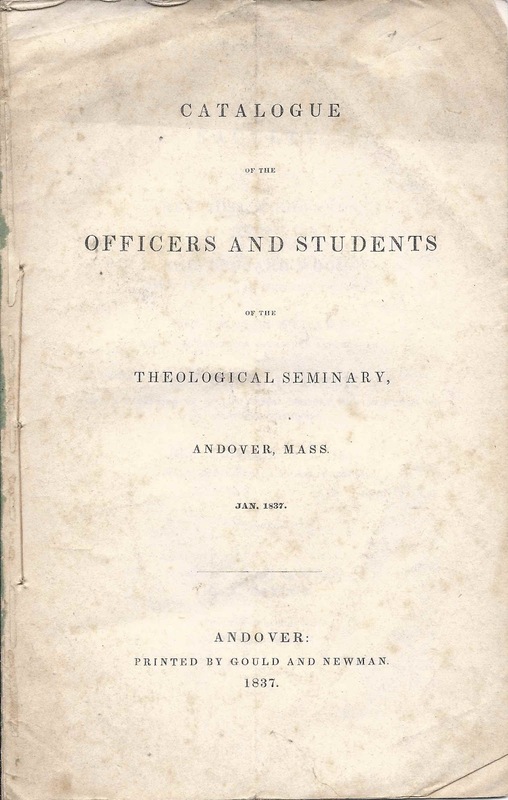 Catalogue of the Officers and Students of the Theological Seminary, Andover, Massachusetts, January 1837. 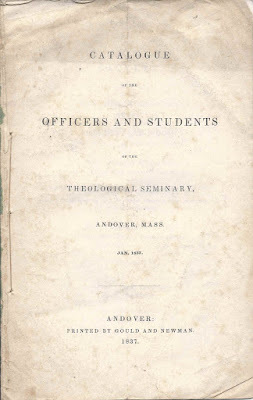 Printed in Andover, by Gould and Newman, 1837. Andover Newton Theological School today. Names - Residence - Pl. of Theo. Ed. 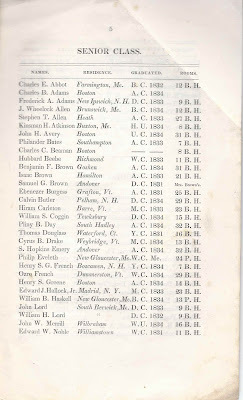 Charles E. Abbot; Farmington, Maine; B.C. 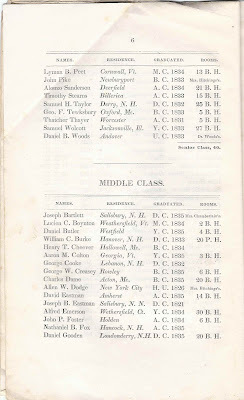 1832, 12 B.H. Frederick A. Adams; New Ipswich, New Hampshire; D.C. 1833; 9B.H. J. Wheelock Allen; Brunswick, Maine; B.C. 1834; 12 B.H. Stephen T. Allen; Heath; A.C. 1833; 27 B.H. Kinsman H. Atkinson; Buxton, Maine; H.U. 1834; 8 B.H. John H. Avery; Boston; U.C. 1834; 31 B.H. 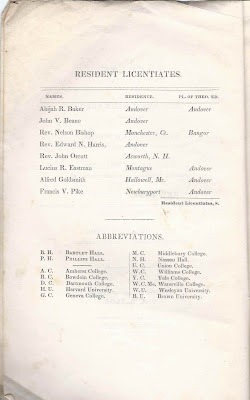 Philander Bates; Southampton; A.C. 1833; 7 B.H. Charles C. Beaman; Boston; __ __; 8 B.H. Hubbard Beebe; Richmond; W.C. 1833; 11 B.H. Benjamin F. Brown; Goshen; A.C. 1834; 31 B.H. Isaac Brown; Hamilton; A.C. 1833; 21 B.H. Ebenezer Burgess; Grafton, Vermont; A.C. 1831; 25 B.H. Calvin Butler; Pelham, New Hampshire; D.C. 1834; 29 B.H. Hiram Carleton; Barre, Vermont; M.C. 1833; 23 B. H.
William S. Coggin; Tewksbury; D.C. 1834; 15 B.H. Pliny B. Day; South Hadley; A.C. 1834; 32 B.H. 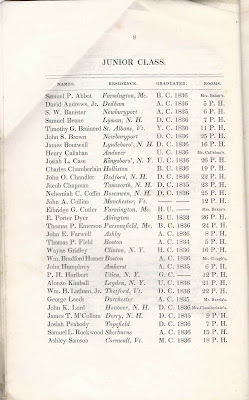 Thomas Douglass; Waterford, Connecticut; Y.C. 1831; 16 B.H. Cyrus B. Drake; Weybridge, Vermont; M.C. 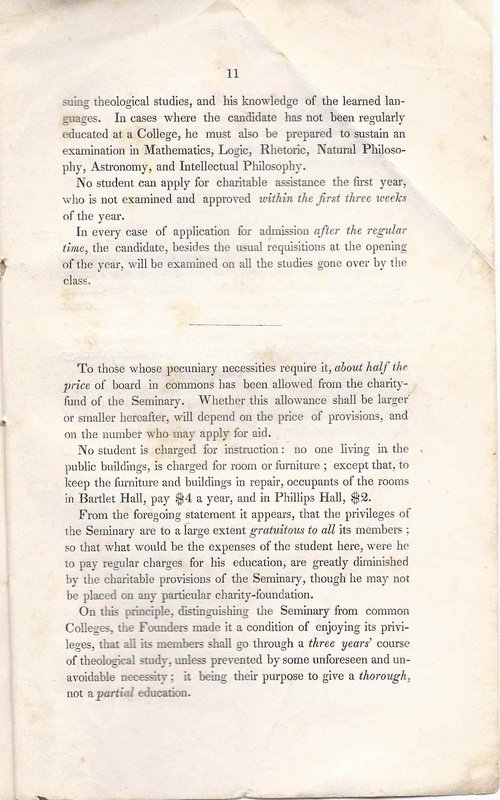 1834; 13 B.H. S. Hopkins Emery; Andover; A.C. 1834; 32 B.H. 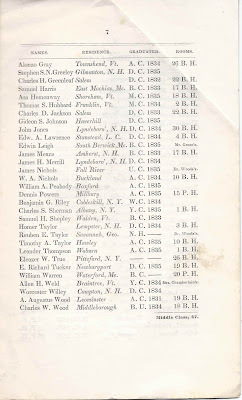 Philip Eveleth; New Gloucester, Maine; W.C.Me; 24 P.H. Henry S. G. French; Boscawen, New Hampshire; Y.C. 1834; 7 B.H. Ozro French; Dummerston, Vermont; W.C. 1834; 29 B.H. Henry S. Greene; Boston; A.C. 1834; 14 B.H. Edward J. Hallock, Jr.; Madrid, New York; M.C. 1833; 23 B.H. William B. Haskell; New Gloucester, Maine; B.C. 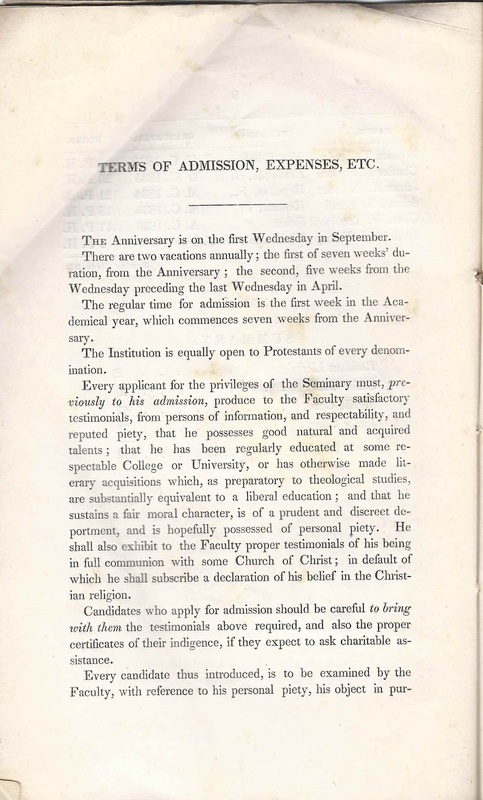 1834; 13 P.H. John Lord; South Berwick, Maine; D.C. 1833; 9 B.H. William H. Lord; South Berwick, Maine; D.C. 1832; 9 B.H. John W. Merrill; Wilbraham; W.U. 1834; 16 B.H. Edward W. Noble; Williamstown; W.C. 1831; 11 B.H. Lyman B. Peet; Cornwall, Vermont; M.C. 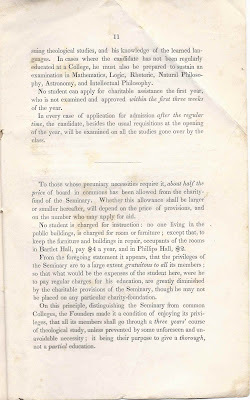 1834; 13 B.H. Alonzo Sanderson; Deerfield; A.C. 1834; 21 B.H. Timothy Stearns; Billerica; A.C. 1833; 15 B.H. Samuel H. Taylor; Derry, New Hampshire; D.C. 1832; 25 B.H. George F. Tewksbury; Oxford, Maine; B.C. 1833; 5 B.H. Thatcher Thayer; Worcester; A.C. 1831; 5 B.H. Samuel Wolcott; Jacksonville, Illinois; Y.C. 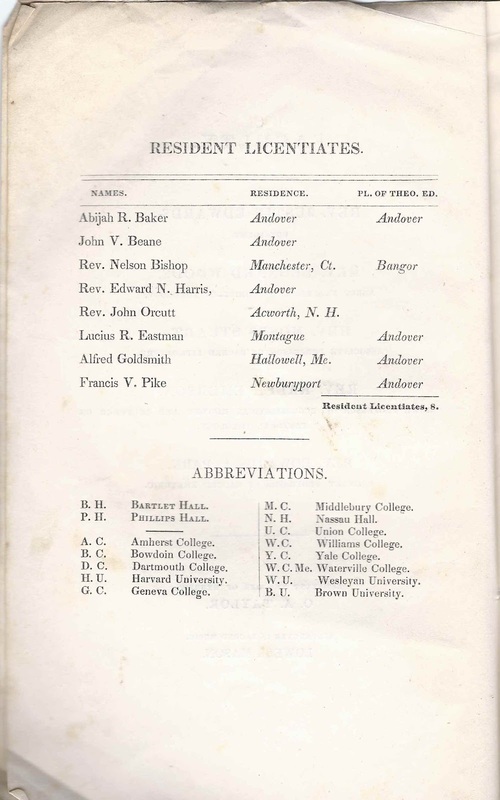 1833; 27 B.H. Lucien C. Boynton; Weathersfield, Vermont; M.C. 1834; 2 B.H. Daniel Butler; Westfield; Y.C. 1835; 4 B.H. William C. Burke; Hanover, New Hampshire; D.C. 1833; 20 P.H. Aaron M. Colton; Georgia, Vermont; Y.C. 1835; 3 B.H. George W. Creasey; Rowley; B.C. 1835; 6 B.H. Charles Dame; Acton, Maine; B.C. 1835; 20 B.H. David Eastman; Amherst; A.C. 1835; 14 B.H. Alfred Emerson; Wethersfield, Connecticut; Y.C. 1834; 30 B. H.
John P. Foster; Holden; A.C. 1834; 6 B.H. Daniel Gooden; Londonderry, New Hampshire; D.C. 1835; 20 B.H. Alonzo Gray; Townshend, Vermont; A.C. 1834; 26 B.H. Charles H. Greenleaf; Salem; D.C. 1832; 22 B.H. Samuel Harris; East Machias, Maine; B.C. 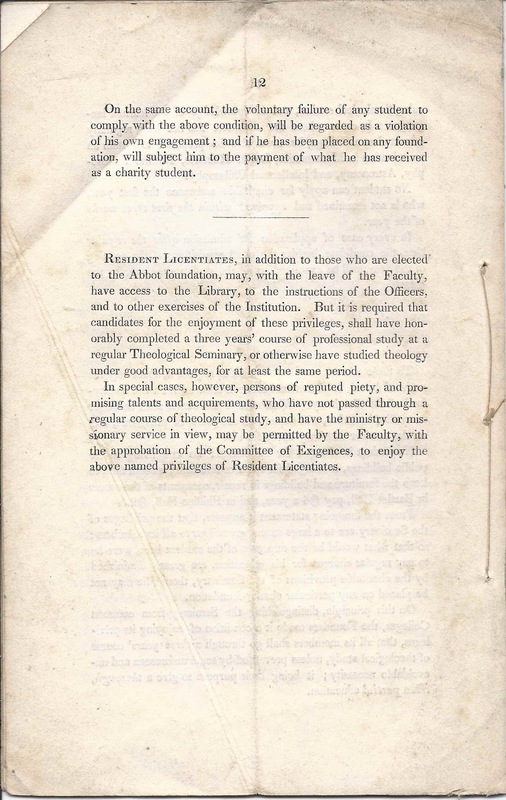 1833; 17 B.H. Asa Hemenway; Shoreham, Vermont; M.C. 1835; 18 B.H. Thomas S. Hubbard; Franklin, Vermont; M.C. 1834; 2 B.H. Charles D. Jackson; Salem; D.C. 1833; 22 B.H. John Jones; Lyndeborough, New Hampshire; D.C. 1834; 30 B.H. 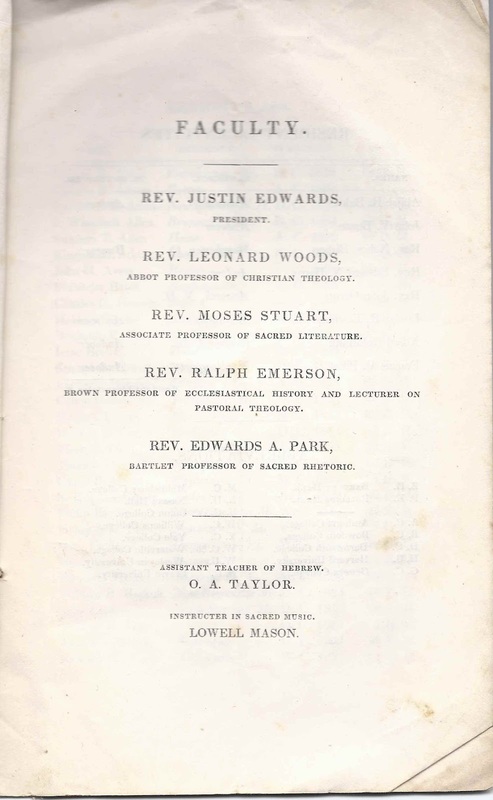 Edward A. Lawrence; Stanstead, Quebec [written L.C. for Lower Canada]; D.C. 1834; 4 B.H. James Means; Amherst, New Hampshire; B.C. 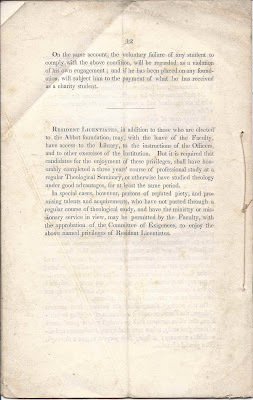 1833; 17 B.H. W. A. Nichols; Buckland; A.C. 1834; 10 B.H. Dennis Powers; Millbury; A.C. 1835; 15 P.H. Charles S. Sherman; Albany, New York; Y.C. 1835; 1 B.H. Homer Taylor; Lempster, New Hampshire; D.C. 1834; 3 B.H. Timothy A. Taylor; Hawley; A.C. 1835; 10 B.H. Leander Thompson; Woburn; A.C. 1835; 1 B.H. Eleazer W. True; Pittsford, New York; __ __; 26 B.H. E. Richard Tucker; Newburyport; D.C. 1835; 19 B.H. William Warren; Waterford, Maine; B.C. __; 20 P.H. A. Augustus Wood; Leominster; A.C. 1831; 19 B.H. 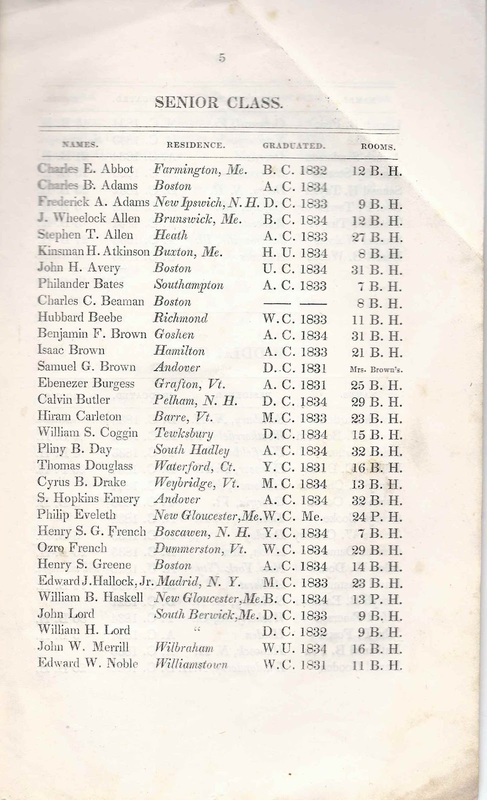 Charles W. Wood; Middleborough; B.U. 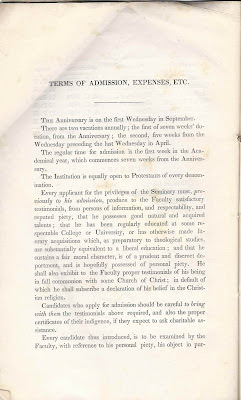 1834; 18 B.H. David Andrews, Jr.; Dedham; A.C. 1836; 5 P.H. S. W. Banister; Newburyport; A.C. 1835; 6 P.H. Samuel Beane; Lyman, New Hampshire; D.C. 1836; 7 P.H. Timothy G. Brainerd; St. Albans, Vermont; Y.C. 1830; 11 P.H. John S. Brown; Newburyport; D.C. 1836; 25 P.H. James Boutwell; Lyndeborough, New Hampshire; D.C. 1836; 16 P.H. Josiah L. Case; Kingsborough, New York; U.C. 1836; 26 P.H. Charles Chamberlain; Holliston; B.U. 1836; 19 P.H. John O. Chandler; Bedford, New Hampshire; D.C. 1836; 22 P.H. Jacob Chapman; Tamworth, New Hampshire; D.C. 1835; 23 P.H. Nehemiah C. Coffin; Boscawen, New Hampshire; D.C. 1836; 25 P.H. John A. Collins; Manchester, Vermont; __ __; 12 P.H. 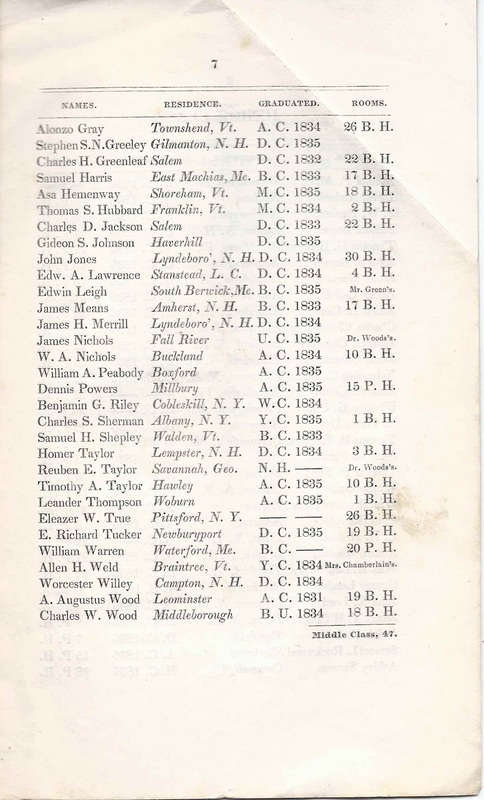 E. Porter Dyer; Abington; B.U. 1833; 26 P.H. Thomas P. Emerson; Parsonsfield, Maine; B.C. 1836; 24 P.H. John E. Farwell; Ashby; A.C. 1836; 8 P.H. Thomas P. Field; Boston; A.C. 1834; 5 P.H. Wayne Gridley; Clinton, New York; H.C. 1836; 16 P. H.
John Humphrey; Amherst; A.C. 1835; 6 P.H. P. H. Hurlburt; Utica, New York; G.C. __; 12 P. H.
Alonzo Kimball; Leyden, New York; U.C. 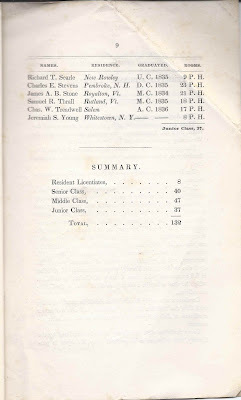 1836; 21 P. H.
William H. Latham, Jr.; Thetford, Vermont; D.C. 1836; 22 P. H.
James T. M'Collom; Derry, New Hampshire; D.C. 1835; 9 P.H. 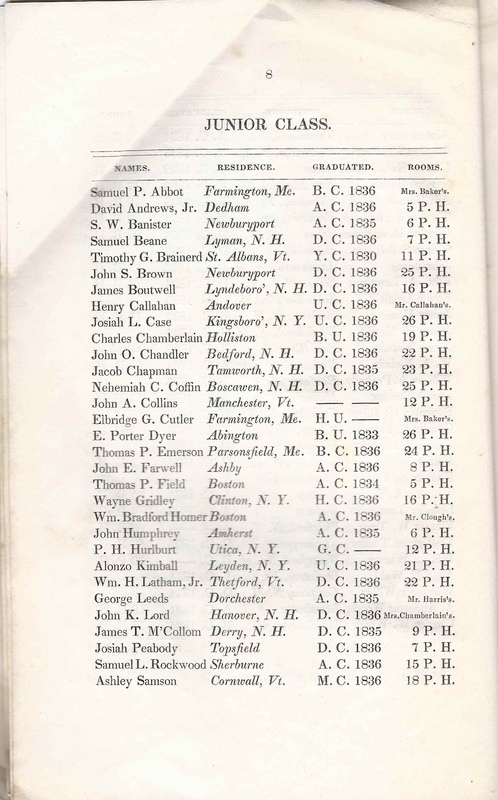 Josiah Peabody; Topsfield; D.C. 1836; 7 P.H. Samuel L. Rockwood; Sherburne; A.C. 1836; 15 P.H. Ashley Samson; Cornwall, Vermont; M.C. 1836; 18 P.H. 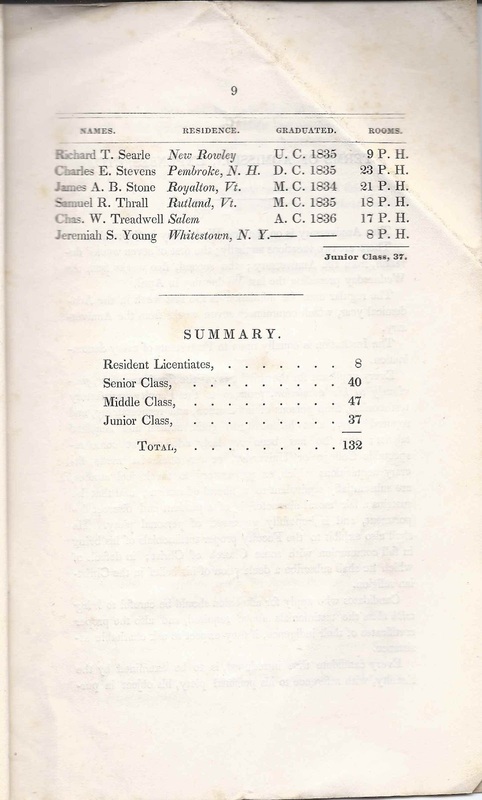 Richard T. Searle; New Rowley; U.C. 1835; 9 P.H. Charles E. Stevens; Pembroke, New Hampshire; D.C. 1835; 23 P.H. James A. B. Stone; Royalton, Vermont; M.C. 1834; 21 P.H. Samuel R. Thrall; Rutland, Vermont; M.C. 1835; 18 P.H. Charles W. Treadwell; Salem; A.C. 1836; 17 P.H. Jeremiah S. Young; Whitestown, New York; __ __; 8 P.H.